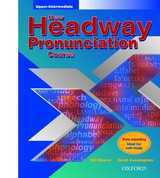 New Headway Pronunciation Course: Upper-Intermediate. A course in English pronunciation to complement New Headway. The units can stand alone. Nice cartoons with gentle sense of humour. The authors must be real professionals: they have included a mixture of phonemes that different nationalities find difficult; and a range of Stress, Rhythm and Intonation subjects all covered in a very practical way and including times and dates. This is a practical and imaginative addition to the New Headway. It helps students to express themselves clearly and confidently by training them in the key areas of pronunciation. There is practice of individual sounds, with a guide to suitable exercises for speakers of particular languages. There is a focus on lexical sets. Training is given in stress and intonation patterns for accurate, functional use. Help is provided with the features of connected speech. New Headway Pronunciation Course - это уровневый курс постановки произношения. Его можно использовать как параллельно с занятиями по учебнику Headway, так и занимаясь по другому курсу. New Headway Pronunciation Course выпускается для четырех уровней: Elementary, Pre-Intermediate, Intermediate и Upper-Intermediate. По нему можно заниматься как в классе, так и самостоятельно. В каждом из уровней рассматриваются основные звуки, интонация, беглая речь и другие аспекты фонетики английского языка. При этом материал каждой книги основывается на лексике и грамматике соответствующего уровня. Этот учебник можно использовать как вводный курс фонетики на начальном уровне изучения английского языка и на более поздних уровнях.